A gyrator is a circuit using active devices and transistors to simulate an inductor. In this case the gyrator is the transistor acting with R1, R3 and C2. It could just as easily be a unity gain op-amp (which gives superior performance). If anyone wants the detailed mathematical working out of these formulae, these may be made available to TEC members, in due time. The mathematics for active filters is not as difficult as most tutors tend to make it seem and I really didn't understand it properly until I worked it out for myself and found that it wasn't that complicated, I just hadn't been taught how to understand it! 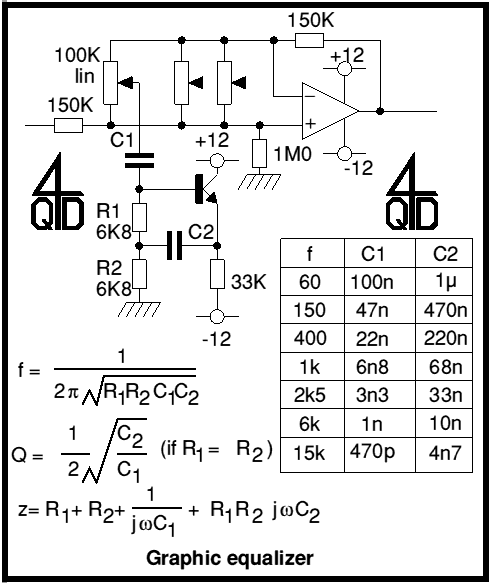 Already available to TEC members is the mathematical analysis of the gyrator circuit used here.